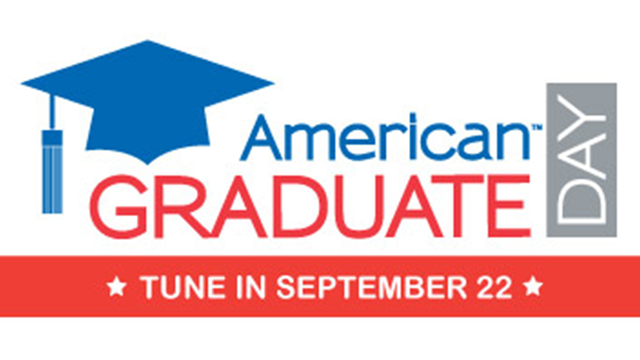 Public media is launching the first-ever AMERICAN GRADUATE DAY on September 22, 2012 from 1-8pm EST. This multi-platform event will feature live local and national programming, partners, celebrities and athletes focused on improving high school graduation rates in America. Journalist Desiree Cooper will host the local show segments and interview 14 local organizations working to help young people stay in school and on track for on-time graduation.Viewers will be encouraged to become an "American Graduate Champion" by offering their time, donating resources, connecting with the organizations on social media or learning more about the crisis. The national segments will host special guests including PBS NewsHour senior correspondent Ray Suarez among others. It will also feature 20 national organizations working to keep students engaged in school, compelling stories from students themselves, and highlights from PBS national and local content - from PBS NewsHour and Need to Know to Jim Glassman's Ideas in Action and Tavis Smiley Reports: Too Important To Fail. The broadcast will also include the premiere of a new student film from Reel Works New York and a preview of the upcoming FRONTLINE documentary, Dropout Nation. Maria Bartiromo (anchor of CNBC's Closing Bell with Maria Bartiromo and host and managing editor of the nationally syndicated The Wall Street Journal Report with Maria Bartiromo), JuJu Chang (ABC News Correspondent), Rehema Ellis (NBC Nightly News Education Correspondent), Susie Gharib (PBS Nightly Business Report co-anchor), Maria Hinojosa (Need to Know host), Stone Phillips (PBS NewsHour contributor), Bianna Golodryga (Good Morning America Weekend co-anchor), Rebecca Jarvis (host of CBS This Morning:Saturday), Bryant Gumbel (host of Real Sports with Bryant Gumbel), Zoraida Sambolin (host of CNN Early Start) and Ray Suarez (PBS NewsHour host), among others, will host the national television broadcast. Celebrities taking part in the event include musician Carmine Appice; ballerina Misty Copeland; former Dallas Cowboy linebacker Darrin Smith; New York Yankees first baseman Mark Teixeira; actor Courtney Vance; philanthropist Elaine Wynn; New York Giants defensive lineman Chris Canty; actor Hill Harper; NBC Nightly News anchor and Rock Center host Brian Williams; host and producer of Bloomberg EDU Jane Williams; and many more. Additionally, actor Denzel Washington and singer John Legend will be featured in taped interviews discussing the dropout problem. Public television stations representing more than 50 percent of U.S. households will broadcast American Graduate Day with many including local content alongside the national features. Viewers will be able to participate in the broadcast by asking questions and sharing ideas before and during the broadcast on Twitter using the #AmGrad hashtag and on Facebook. Those interested in becoming an American Graduate Champion can also call in at 800-313-2477 or log on to AmericanGraduate.org to find out more about the national and regional organizations and how to help in their hometowns. Among the national organizations that will participate in the broadcast are After School All-Stars, America SCORES, Big Brothers Big Sisters, The Boys and Girls Clubs of America, buildOn, CFY, City Year, Communities in Schools, Girls Inc., Harlem RBI, Horizons National, Jumpstart, Little Kids Rock, NYC Mayor's Interagency Task Force on Truancy, Chronic Absenteeism and School Engagement, NAACP, National Council of La Raza, Reel Works, United Way, YouthBuild and the YMCA. Local organizations include, Big Brothers Big Sisters, The Boys and Girls Clubs of America, Black Family Development, City Year, Communities in Schools, Detroit Hispanic Development Corporation, Excellent Schools, Matrix Theatre Company, Michigan Department of Education, United Way for Southeastern Michigan, Widening Advancements for Youth, Winning Futures and the YMCA. American Graduate Day is part of the public media initiative, American Graduate: Let's Make It Happen, made possible by the Corporation for Public Broadcasting (CPB).